HOLLY SPRINGS, Miss. – Edmond and Caleb Ellison dominated the racing action on Saturday at the BTE Southern Footbrake Challenge with Edmond taking home the $10,000 to win main event and Caleb picking up the $2,000 Gamblers race win. After battling rain for the first couple of days of the event, racers were blessed with a beautiful sunny day on Saturday. Over 180 of the nation’s best footbrake racers lined up for first round taking their shot at the $10,000 winner’s purse. The quarterfinal round included John Burleson, Rob Fisher, Edmond Ellison, Jud Bostick, and Luke Siebert. Burleson used a 14 light and a 2 over 6.87 to eliminate Fisher, Ellison threw a 17-pack at Bostick to move to the semi’s, and Siebert took the bye. At three cars, Burleson earned the bye which left Ellison and Siebert to battle it out for a spot in the final round. Ellison followed up his 17-pack in the quarterfinals with an even better 14-pack in the semi’s leaving Siebert mathematically ineligible after he posted an 18 light. 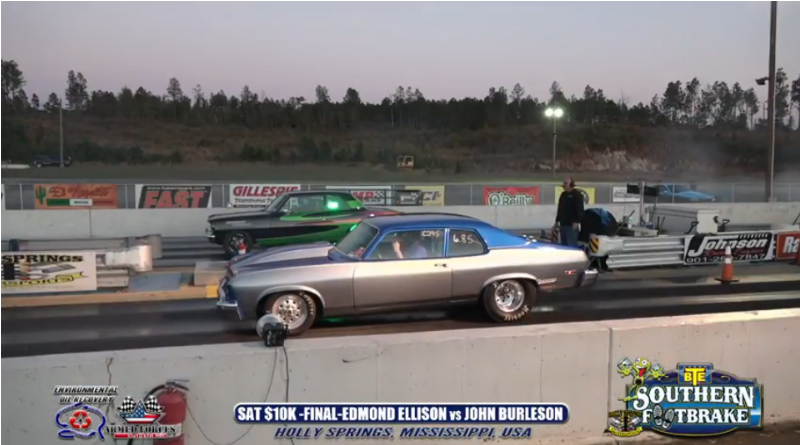 In the $10,000 main event final round, Ellison continued his dominance at the tree leaving with a perfect .500 light in his Chevy II to take a huge lead after Burleson missed the tree with .563 light in his Nova. At the finish, Ellison posted a 4 over 6.54 to collect the win after Burleson dumped to a 7 over 6.92. After collecting the main event win, the Ellison family was not finished as Edmond’s brother Caleb was entered in the $2,000 Gamblers Race. Not to be outdone, Caleb raced his way to the final round where he faced off with Aaron Jones. Caleb posted an 18 light and a 1 over 5.80 to take down Jones who was 33 and 1 under. It was a huge day for the Ellison family as they made a clean sweep of both races on Saturday. Another $10,000 to win main event awaits racers on Sunday as the event draws to a close. Click here for Friday results and here to watch the BTE Southern Footbrake Challenge live online. DragChamp is your source for sportsman drag race results. Visit DragChamp daily for the latest bracket racing news, results, and information. Look what this kid can do in a dragster!